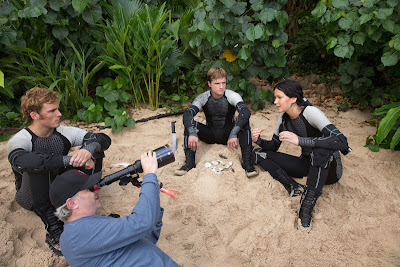 After his fantastic work on Catching Fire, we know everyone wants to hear what director Francis Lawrence has to say. Luckily, a multitude of interviews with the man himself have been posted online, discussing Catching Fire, and also Mockingjay, which is currently in production. "The ending comes from the book, of course, but the big difference with the very last scene is really the nuance in Jen’s performance. I think that was something that she and I worked on and saw something happen on the day, and that changed the way I shot it a little bit. Other than that, the dialogue comes straight from the book." "I remember specifically that even when we had some different dialogue, and there was a different interpretation of the scene, we just said, ‘You know what? Let’s do what’s in the book.’ And we word-for-word picked the dialogue out of the book, so it’s all pretty close. The book does take a little more time getting to that last scene, though. We didn’t want to do that, but we went for the book ending." "The only thing that was a little intimidating about taking on the Mockingjays, and I’m in the middle of it now, was accepting the lengthy shoot. It’s a long time away from home and that was a tricky thing to work out in terms of family, but to know that I’m seeing these stories out, that I’m going to get to do the book that I think, personally, gives the whole meaning to the series, is very exciting." Click for more interviews from: Fast Company and 3News.